Yesterday's the New York Times published a very nice analysis of Twitter's bot market. 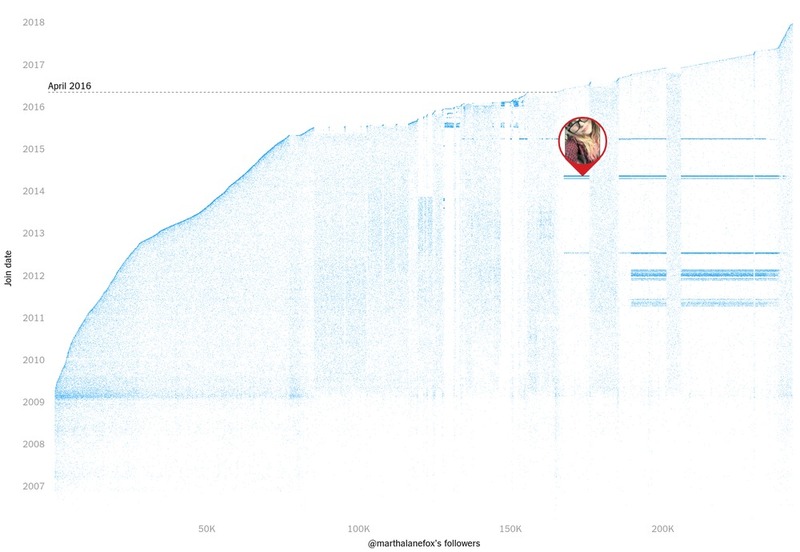 Part of this analysis involves plotting the list of followers for a given account in an orderly fashion (the most recent last) on the x axis, and their creation date on the y axis. If abnormal patterns emerge, this can be an indication of foul play. 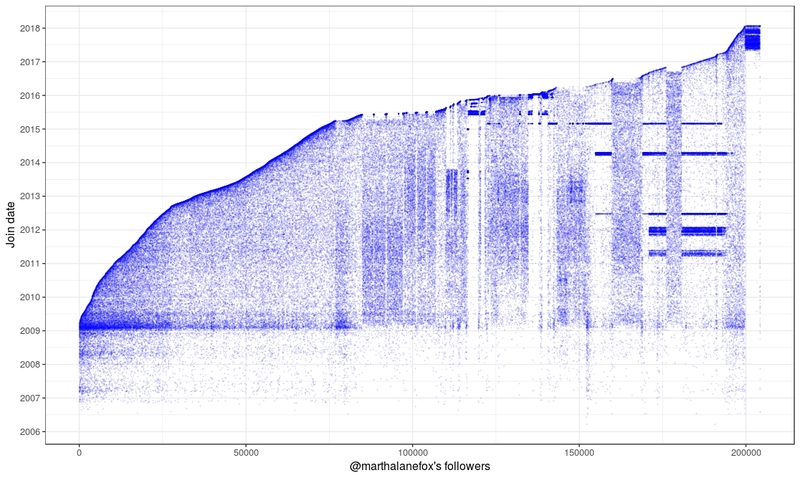 Those horizontal streaks mark massive following events carried out by bots. They stand out very clearly against the boring pattern of organic growth. So I started thinking: how difficult can it be to replicate that kind of plot using not a lot of code, if possible? It turns out it can be fairly easy. get_data.py: obtain data using Twitter's API, save it to a local file and, at the same time, build a cache so we don't have to query the same account twice. plot_data.R: what the name says. # just the results of the first returned page). # [user_id2, date2, n_tweets2], ...]. print "Have all info in cache already"
# first, so we can use this to add another column with the proper ordering). You'll see it's fairly simple. It's only two main functions: get_follower_list is just a single call the API wrapper that will return a list with all user_ids following a certain account. get_follower_info will receive that list as an input and, for every user_id, will return also the creation date and the number of tweets (might be useful for some other thing, but can be ignored for this). Data gathering is a very slow process due to Twitter's API limitations. As I knew I would end up inspecting several different accounts, I build a very simple caching system on the main part of the code, so every time we obtain the list of followers for a given account, we store the relevant information in a local dictionary. If there is overlap between the followers of two accounts (and there will be), we only have to obtain the creation dates for the ones we don't already have. Funnily enough, it looks like there is another bot wave joining the ranks right after the date when NYT's analysis stopped gathering data.